For a publication as venerated as The New Yorker, you would think they would be more sensitive to using a description like “ghetto chic” so freely, but they, and for a brief about artist (and fashion favorite) Solange Knowles. 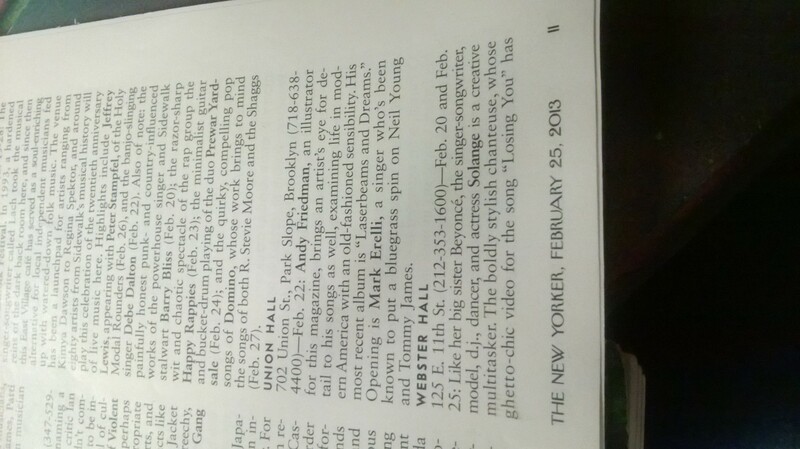 Printed in last year’s February 25, 2013 issue, in what’s basically their what’s happening section, for Solange’s Webster Hall concert date, in a backwards compliment, some writer chose to describe the video to her lush single “Losing You” as “ghetto chic”. What? Did they actually watch the video? The treatment for “Losing You” was praised by many for its evident appreciation of the South African style and pop culture of Cape Town and where the video was shot on location in the neighborhood of Langa. Showing us another side of the African way of life most of us rarely get to see, from the colorful suits and glowing local extras, there is nothing “ghetto chic” about “Losing You”. It was glorious and free, and for such a somber break-up song, the visuals were quite blithe. This may also bring in question, what exactly is “ghetto chic”? Well, you likely won’t find it in this specific clip from Solange. Shame on you, The New Yorker, for trying to be hip and instead coming across as misinformed.